“I admit it. I'm a yarn fan-girl. I love looking at it; talking about it; stashing it; shopping for it; being surrounded by it. 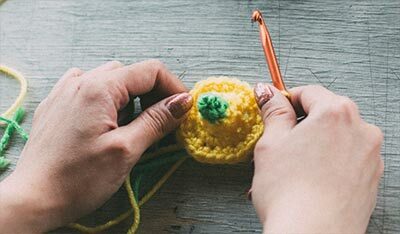 Oh, and designing, knitting and crocheting with it isn't so bad either! 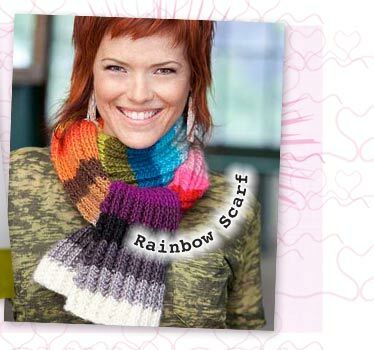 As you can imagine, having my own yarn line—Stitch.Rock.Love for Caron—is pretty much this knit-nerd's dream. Recently the line launched its first yarn, Sheep(ish)—and so my love affair with fiber continues as I proudly wear all of it's colors in a cheerful, rainbow scarf. 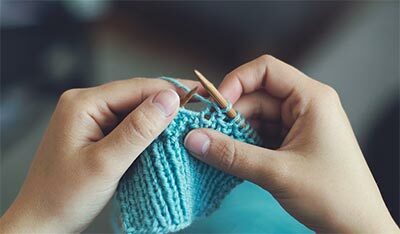 I hope that when you knit up your own version—using anywhere from 2-21 colors—you'll consider it your own personal fiber flag; one that exclaims, "I love yarn!" Size US I-9 (5.5mm) crochet hook or size needed to obtain gauge. In netted stitch pattern, slightly stretched. Gauge is not that important for this project. 2nd row: *Ch 5. 1 sc in next ch-5 sp. Rep from * to end of row. Turn. Rep 2nd row until piece measures 17” [43 cm]. 1st row: Ch 1. *5 sc in next ch-5 sp. 1 sc in next sc. Rep from * to end of row. Turn. 25 sts. 2nd row: Ch 4 (counts as tr). 1 tr in first sc. *Ch 5. Miss next 5 sc. 2 tr in next sc. Rep from * 3 times more. Turn. 30 sts. 3rd row: Ch 4. 1 tr in first tr. 2 tr in next tr. *Ch 5. Miss next ch-5, (2 tr in next tr) twice. Rep from * 3 times more. 40 sts. 4th row: Rep 1st row. Using tapestry needle and yarn, seam tog both flat edges of Scarf. Pinch center at the seam you just created so fabric is gathered; sew in place to create ruching. 3 Balls (or up to 21!) Stitch.Rock.Love Sheep(ish) for Caron (30%Wool/70% Acrylic; 167 yds/154m) in assorted colors. Row 1: K2, P2; ending with p2, p1. Rows 3-168: Repeat last two rows, changing colors after every 4th row. Note: If you’re duplicating my version exactly, you’ll use all 21 colors of Sheep(ish). The color pattern will be repeated twice, as a mirror image of itself as follows. Repeat pattern in the reverse order, beginning with Robin’s Egg(ish)&mdash;they’ll be an 8 row stripe of this color in the center of your scarf. 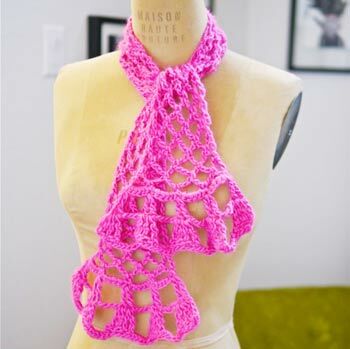 Tip: This scarf would look great using only 4 colors, too! Either pick a contrasting palette, or else just choose a pairing of 4 from my scarf! Weave in ends. Block if necessary.